Distinguishing Characteristics : Hens (females) Pearl is an all-white hen, and her caruncles (maks) are bright red and fully developed. Opal has a black head and has a mostly dark body with a patch of white on her breast. Her caruncles are just beginning to develop. Both are much larger than an average duck, weighing in about 7 pounds. This is a domesticated breed. Details : The drake was killed, but those two might have flown the scene. 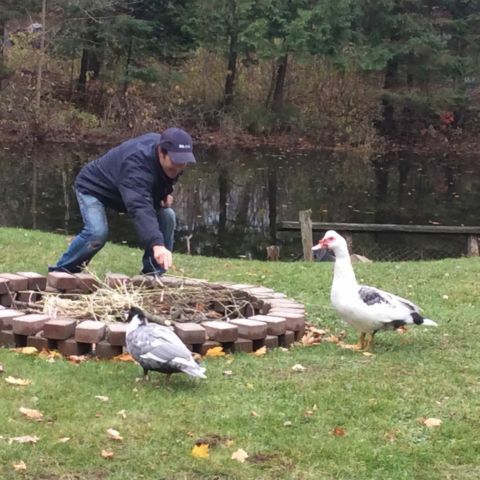 Our 2 Muscovy ducks (hens) are missing after a predator attack. Their drake was killed but we suspect that the girls flew to safety. Pearl is an all white hen with bright red fully developed caruncles (mask) Opal has a black head and mostly dark body with white on her breast. Her caruncles (mask) is just beginning to develop. They are both much larger than the average duck, weighing in at about 7 pounds. They are a domesticated breed and will need help to survive the winter. If you spot them please contact us! Published on our partners' Facebook pages and on our own and also on our Twitter. 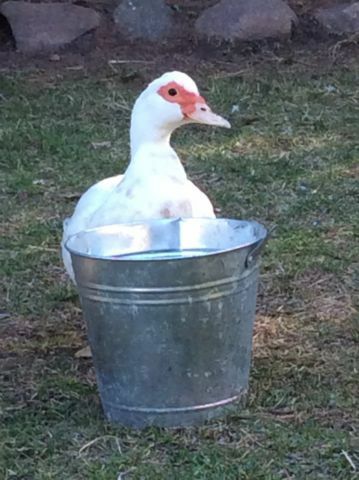 It seems that they may have found the other duck, but it's not clear.